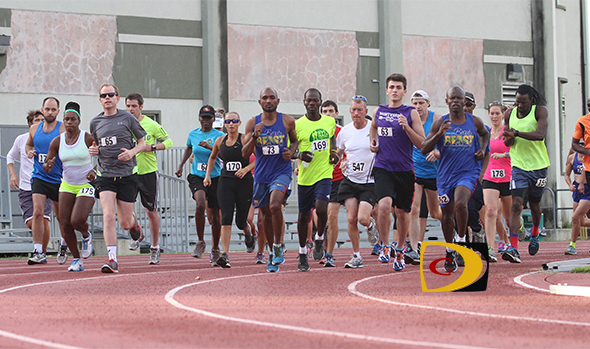 JUNE 1—Versatile Maxford Pipe had his easiest weekend of the season in winning the kick off of the 2014 Ceres Juices 10K Series on Saturday. Typically playing Cricket and Football as well, his Vincy team was eliminated from the June 1 Digicel Twenty 20 final and his Football team was not in action. Added to the mix, Guy Williamson, his biggest road racing rival was also absent. Running unchallenged, Pipe took control within the first quarter mile of the City Circuit race en route to winning in 41 minutes and 33 seconds. He was followed by Julius Farley in 43:42 and Ian Montgomery in 43:55. Katrina Crumpler—seventh overall—was the top woman in 47:47 and was followed by Prudence Cooper in 51:04 and NiMade Oniaish in 52.08. The next race in the series that leads up to the BVI Half Marathon in November, is on June 28 in Carrot Bay. Final Results: 1. Maxford Pipe, 41 minutes and 33 seconds. 2. Julius Farley, 43:42. 3. Ian Montgomery, 43:55. 4. Curwin Andrews, 44:59. 5. Ravindra Sukhu, 45:28. 6. Adam De Monte with buggy, 47:37. 7. David Kinkead, 48:06. 8. Zebalon McLean, 50:21. 9. Ciaran O'Shaughnessy, 50:26. 10. Adrian Dale, 50:32. 11. Shaun Reardon John, 50:57. 12. Charles Kerins, 52:08. 13. Joseph McIvor, 57:32. 14. Paul Hubbard, 53:16. 15. Shane Donovan, 54:26. 16. Jude Kinkead, 56:51. 17. Kenton Brewley, 1:00.36. 18. Ruairi Burke, 1:01.58. 19. Andrew Willins, 1:02.28. 20. Howard Moore, 1:04.47. 21. Stephen Beard, 1:07.09. Women: 1. Katrina Crumpler, 47:47. 2. Prudence Cooper, 51:04. 3. NiMade Oniasih, 52:08. 4. Clare-Louise Whiley, 53:35. 5. Kay Reddy, 56:04. 6. Natasha Ruscheinski, 56:25. 7. Anna Kinkead, 56:52. 8. Sue Tucker, 57:30. 9. Gillian Plaxton, 58:12. 10. Rosmond Johnson, 58:42. 11. Sally Blackmore, 59:50. 12. Samantha Sukhu, 1:00.30. 13. Philomena Robertson, 1:04.16. 14. Maureen Peters, 1:04.57. 15. Amity Hill, 1:11.24. Power Walking: Men. 1. Deberio Alexis, 1:28:17. Women: 1. Sophie Bennett, 1:31:32. 2. Juliet Wade, 1:37:40.